Behold the Mighty Books of Tharg ! By Alan Moore, Steve Dillon, Bryan Talbot, Ian Gibson, Alan Davis, Dave Gibbons and many others. 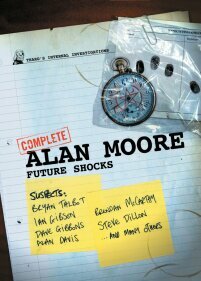 Together for the first time in one volume are all of Alan Moore's Future Shocks - darkly funny and deliriously twisted tales of sci-fi terror, where nothing is what it seems. This thrill packed-collection features the art of many legendary names in the comics industry including Ian Gibson (The Ballad of Halo Jones), Bryan Talbot (Luther Arkwright) and Dave Gibbons (Watchmen). Also included are over a hundred pages of bonus material featuring dozens of complete stories scripted by Moore for 2000 AD. 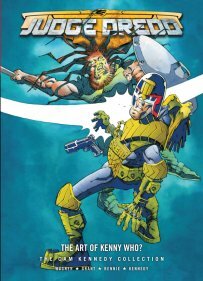 JUDGE DREDD: THE ART OF KENNY WHO? With dreams of fame and fortune Kenny Who? comes to Mega-City One, believing himself to be one of the great undiscovered artists. However, in the ruthless world of the trashzines robots have replaced human art and Kenny's hopes are dashed before him. When the robots start to copy his work though, Kenny Who? becomes a man with vengeance on his mind. Who? will show the Big Meg that you should never mess with a comic book artist!